At Leather Waves, every custom leather product is made by the skillful hands of Jackie Robbins. 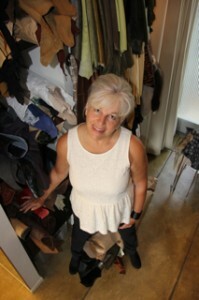 Her expertise in custom leather work spans 5 decades. Known widely for her incredible talents in translating client specifications into custom leather items for her clients is renown. If you have ever wanted a custom leather jacket that was just the right color and type of skin or fabric you should talk with Jackie. If you can’t find the right sizing or fit for a pair of custom leather pants, look no further, make an appointment with Jackie Robbins at Leather Waves today!